What happens in Vegas stays in Vegas..true, this is one of the first thoughts that comes to mind when someone says, "Las Vegas." After years of developing one of the most visited cities in the United States into a booming hot spot for a weekend getaway, Las Vegas has every aspect of tourism down to a science. Since the main source of revenue for the state - tourism - attracted 38.9 million visitors last year alone, it is safe to say that source of revenue is secure. What is a bit more tedious is the healthcare industry. While there are several facilities that offer great quality, the city is simply not marketed as a place to go for healthcare. "Our number one economic driver is always going to be tourism and those looking to come to Las Vegas for vacations and conventions," said Las Vegas Mayor Carolyn G. Goodman. "But I really see medical tourism as a new area that will be a strong secondary economic driver now and in the years to come. 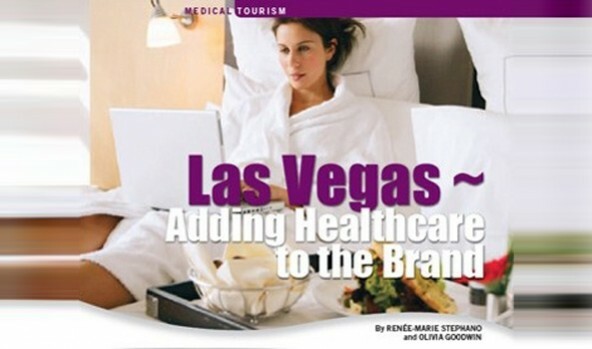 Las Vegas is all about hospitality, and that translates very well to medical tourism." When traveling for medical care or wellness, chances are you will need to stay in a hotel room and have more than one meal in a restaurant, unless you have family in that area to stay with. And, the patient may be up for some tourist activities,depending on the type and invasiveness of the procedure and its recovery time. The point is that Las Vegas is one of the top destinations to go to for fun, so why not go there for a quick procedure, have some fun and enjoy the five-star hospitality while you recover? "We have the amenities to support the medical tourism industry, with more than 150,000 hotel rooms at every budget level," said Chris Meyer, the vice president of sales for the Las Vegas Convention and Visitors Authority (LVCVA). "The selection and value available in Las Vegas, combined with the proximity of the hotel corridor to the airport, make our medical care community desirable and easy to access." Las Vegas has been branding themselves as a tourist destination for years. "It would take other destinations decades to recreate what we have built," said Doug Geinzer, CEO of the Southern Nevada Medical Industry Coalition (SNMIC). "We have been serving international tourists, and our culture revolves around great customer service." Las Vegas has established centers of excellence in the areas of orthopedics, bariatrics, plastic surgery, dental implants and fertility. The city is not trying to brand itself as a leader in transplants; it wants to focus mainly on non-invasive procedures, ones that have a quick recovery time. One such procedure is the sleeve gastrectomy, which shrinks the stomach to a quarter of its size in a 30-minute surgery. "The operation lends itself to medical tourism because someone can come to Las Vegas, have the operation, then spend a few days in Las Vegas," Dr. James Atkinson, of the Surgical Weight Control Center, told KLAS-TV 8 News NOW. "When they go back home, they don't have to come back every month for follow-up." "We fully expect Las Vegas to emerge as the leading destination for health and wellness. If you think about it, Las Vegas has probably introduced more people to spa treatments than any other city in the world," Geinzer said. "There is no reason we cannot build upon that infrastructure and begin to introduce the world's people to other areas of wellness programs and non-invasive procedures." They plan to leverage the relationships they have already established with visitors who choose to take advantage of the spa offerings. In addition to people traveling there for leisure, Las Vegas also sees high numbers of conventions. Every year, its resorts host more than 19,000 meetings, conventions and incentive programs, ranging in size from 10 to over 100,000 attendees. "This target audience includes more executive level professionals than any single market out there. This group understands the value of quality healthcare, and they are already traveling to Las Vegas, why not introduce them to wellness programs?" Geinzer said. "Our partnership with the LVCVA allows us to readily communicate with this audience pre-event, during the conference and post-event." As a way to highlight all of the tourism and wellness offerings, the LVCVA published the "Las Vegas Health and Wellness Destination Guide" in collaboration with the. The guide, available and distributed mostly at conventions and meetings, provides a comprehensive list of resources with more than 20 pages of clinical listings and more than 60 pages of hotels and attractions. It was designed with the consumer in mind and compiles all of the options Las Vegas has to offer for health, wellness and tourism. "The Destination Guide has created excitement around medical tourism and has provided the necessary tool to turn perception into reality. Las Vegas is well on its way to becoming the most desired destination for quality health and wellness services," said Geinzer. "Since the release of the guide, we have received a tremendous amount of local and regional government and accompanying industry support in furthering our initiative to deliver Las Vegas as an international health and wellness destination," said Meyer. The SNMIC, LVCVA and the City of Las Vegas are all working together in an effort to join forces for the promotion of medical tourism. The SNMIC was established in 2002 with the mission to improve the quality of healthcare for southern Nevadans. "As a 'health care cluster,' we have been able to identify all of those businesses in the industry and begin building alliances with a common mission. As we improve access to quality healthcare, we improve quality," Geinzer said. "Medical tourism is a way for us to continue improving access, as world-class practitioners want to be able to serve a global audience." Moving forward, the SNMIC is conducting an analysis of its key assets. "After we identify four to six core procedures we can focus on, we will begin to roll out a more formal marketing strategy," Geinzer said. "What we do not want to do is promote an area where we do not produce world-class outcomes. Quality healthcare delivery will remain our primary driver." Future plans also include targeting the Asian marketplace. "The Asian population is one of the fastest growing, and they love to travel to Las Vegas," Geinzer explained. "McCarran Airport opens up its new terminal in June 2012 expanding international flights." While SNMIC is pinpointing the target markets, the LVCVA is in the process of hiring a medical tourism sales manager for the first time and is working closely with Mayor Carolyn Goodman. "She [Goodman] is a huge proponent of medical tourism," Meyer said." She is working to encourage visitors to explore the medical advantages we have here in Las Vegas. "Goodman said that the Cleveland Clinic Lou Ruvo Center for Brian Health is just one example of the highly specialized clinical centers and research institutions that are coming to Las Vegas." We continue to work to attract world class physicians and top quality medical care to Las Vegas both for the quality of life that we enjoy here and because of the world class medical operations that are located here," she said. The Mayor also mentioned that the city is currently in negotiations with Cleveland Clinic to bring additional specialized medical facilities and researchers to an expanded medical campus in the downtown Symphony Park development. In August 2012, southern Nevada will be home to another state-of-the-art facility, the first Veterans Affairs Hospital to be built in the country since the end of the Gulf War. Meyer said, "The opening of the new VA hospital, combined with the Cleveland Clinic Lou Ruvo Center for Brain Health and other leading healthcare facilities, shows Las Vegas is a premier destination, not just for leisure and business, but also for healthcare." Renèe-Marie Stephano is the President of the Medical Tourism Association. Ms. Stephano is also the Editor-in-Chief of the Medical Tourism Magazine, Health Tourism Magazine and Healthcare Development Magazine. Having a background in international marketing and relations, health law and litigation, she provides a valuable service to the Medical Tourism Association in these fields. She may be reached at Renee@MedicalTourismAssociation.com.